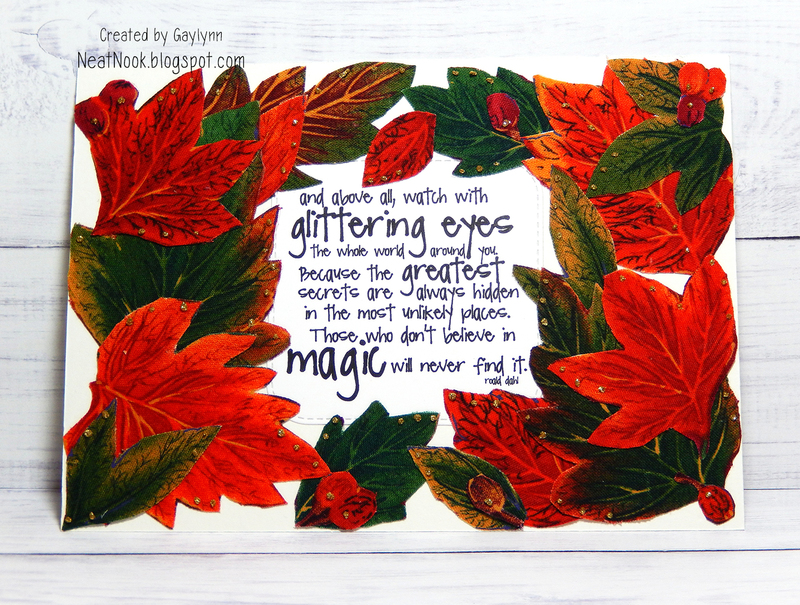 Hello, it's Gaylynn here with an Autumn postcard for the CardMaker and Terial Arts blog hop. This post focuses on creating a postcard with fabric and Terial Magic Fabric Stabalizer spray. I made a photo tutorial showing the steps for this project. I found a beautiful piece of fabric in my Fall decorations. I wanted to isolate the leaves. But first, I needed to prepare the fabric with the spray. Step 2: Once the fabric is damp dry, iron it on low over parchment paper, to protect your ironing board. The fabric will be more stiff, once dry. Step 3: Cut the leaves and accents out with scissors. Using double-sided adhesive, arrange them around a sentiment onto the front of the postcard. This shows the front with the leaves and also what the back looks like. I added glitter dots around the leaves to complement the quote. This is going to be a decoration piece of mine for Autumn. Because of so many pieces in this, I suggest using an envelope if mailing something this layered. This blog hop is just for fun and is filled with inspiration. Visit and leave a comment on each blog in the hop. The full lineup will be on the CardMaker blog, if you get lost along the way. I would love your comments and to read other great uses for this fabric spray. Supplies: Terial Magic Fabric Stabalizer, Unity Stamp Co. Glittering Eyes, Canson cold press watercolor paper, postcard template, double-sided adhesive and glitter glue. 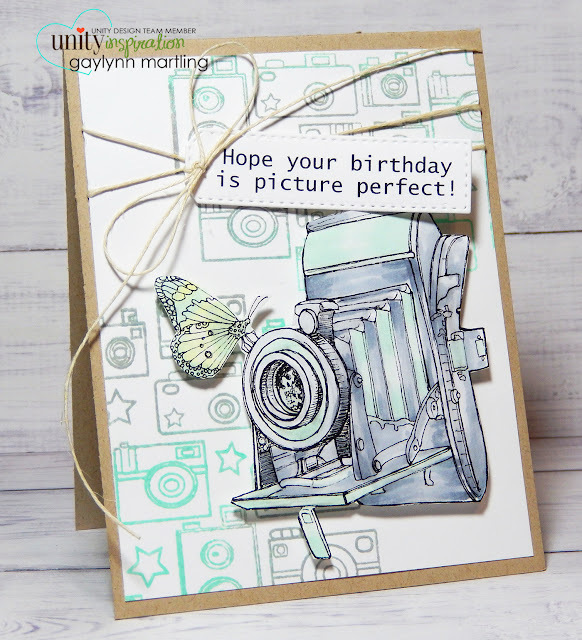 Today, I am up on the Unity blog with this camera card project for the newest Uniquely Unity stamp kit. Sentiment: Hope your birthday is picture perfect. For this card, I heat embossed the background in two different colors. And for the main camera image, I used Copic markers then cut it out. Three kits were mixed and matched in this. Here is a video tutorial showing the process. And here is the card a little closer. My niece Julie's site is Olly View Photography and my cousin's is Newbrough Photo. Supplies: Unity Stamp Co. Possibilities Await Uniquely Unity Oct 2017 by Tierra Jackson, Simply Vintage by Gina K Designs and Just a Little Clicky by Angie Blom; My Creative Time tag dies, Copic markers, embossing powder, Ranger Archival ink and Clearsnap ColorBox ink. Inspirational watercolor accents and butterflies. 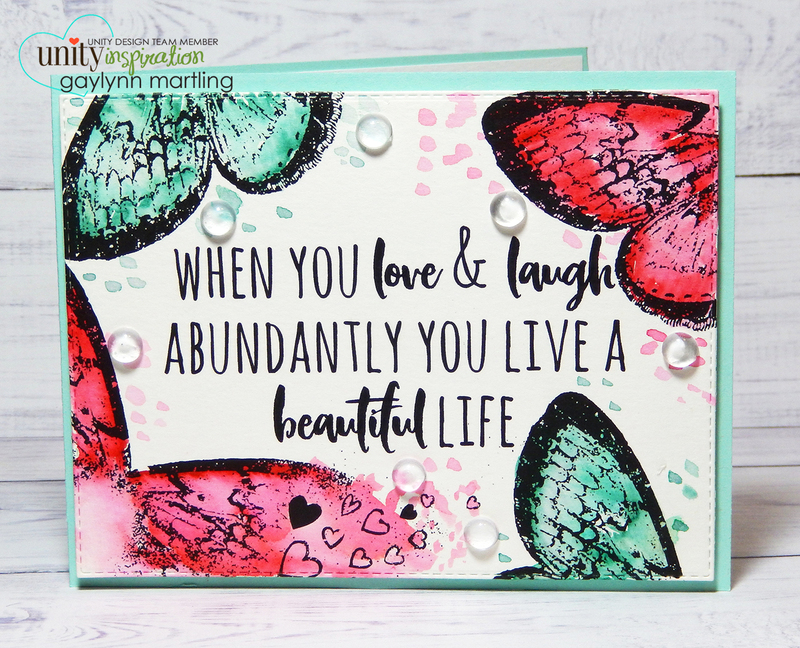 Here is an inspirational card with butterflies and watercolor. Sentiment: When you love & laugh abundantly, you live a beautiful life. For this card, I repeated the butterfly stamping around the sentiment. And then, I added bright and cheerful watercolor and accents. Here is a quick video tutorial for this butterfly card. Supplies: Unity Stamp Co. Love Abundantly October 2017 Layers of Life, Ranger archival ink, distress markers and water brush, Canson watercolor paper, Papertrey, Ink cardstock and Pretty Pink Posh droplets. A little note about my cards: I have greeting cards for sale on my website plus the ones seen here on my blog and on my facebook page. These are one of a kind creations of mine. If you happen to see something that you would like to purchase or to request a custom order, leave a note or message me and I will get back with you. An inspirational card with Unity's Jane Girl. Here is a vintage style inspirational card using watercolor and paper layers. Sentiment: Stay patient and trust your journey. I gave this card a vintage look with distress ink and watercolor. It is a great inspirational card for supporting friends and family. I made a video tutorial for it. Supplies: Unity Stamp Co. Jane Girl by Angie Blom, Ranger archival ink, distress ink and distress markers, Spellbinders dies, hemp, Canson watercolor paper and BasicGrey paper. Today, I am up on the CardMaker Magazine blog with my tip for today. Sentiment: Boo-lieve in all good things. Go check out the CardMaker blog to see my favorite stamping inks for use with watercoloring. 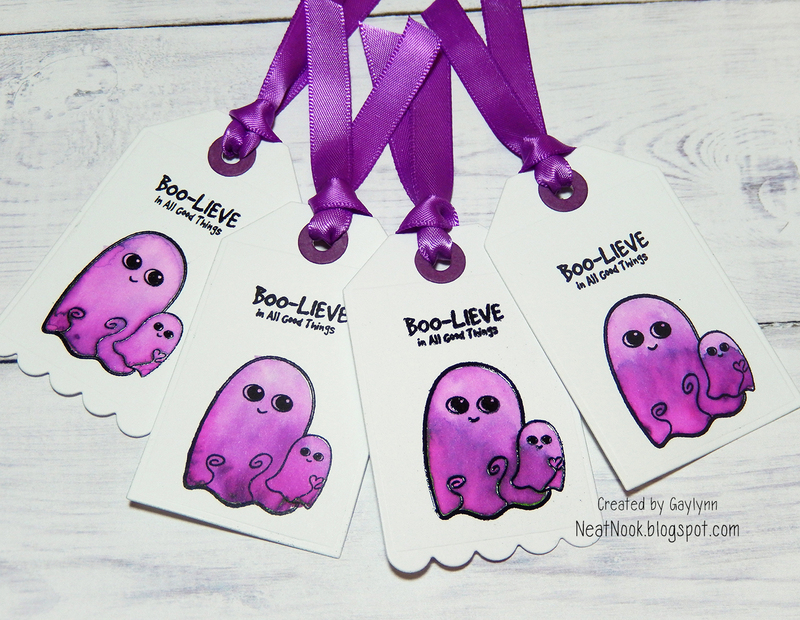 I made these cute ghost tags to demonstrate each way of using the inks prior to watercolor. It is time for Halloween decorations. I like to decorate little treat favors for the trick-or-treaters. These tags will go on some of those goodie bags. Now head on over to CardMaker to read more about this project. 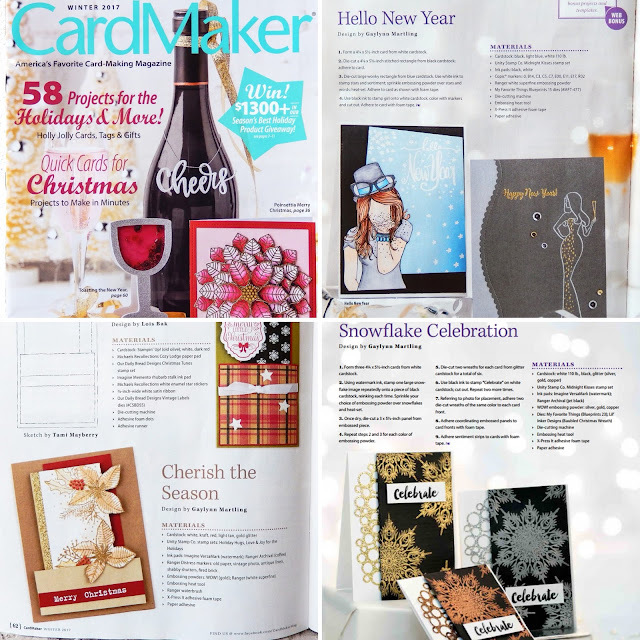 I finally get to share that my projects are featured in the Winter issue of CardMaker Magazine and also in their Web Bonuses section. For CardMaker exclusive web bonuses, go to CardMaker Magazine.com and log in using your subscriber email address or newsstand code CM6454 to download bonus projects and templates. The three snowflake cards are included in the Web Bonuses section. For more information, check out the Winter 2017 magazine issue in print or online. I used stamps from Unity Stamp Company: Midnight Kisses, Holiday Hugs and also Love & Joy for the Holidays. I also used products from Lil' Inker Designs, My Favorite Things, Copic, Neenah and Ranger Industries. Quick & easy Christmas card making. Here is one way to make your own quick and easy handmade holiday cards. Sentiment: May your days be merry & bright. I used the beautiful silhouette reindeer in the October 2017 sentiment kit at Unity along with patterned paper and hemp. I used die-cuts, but this can easily be made with a paper trimmer or punches. For multiple cards, trim all of the pieces in the same setting. Then stamp on the image panels and assemble. 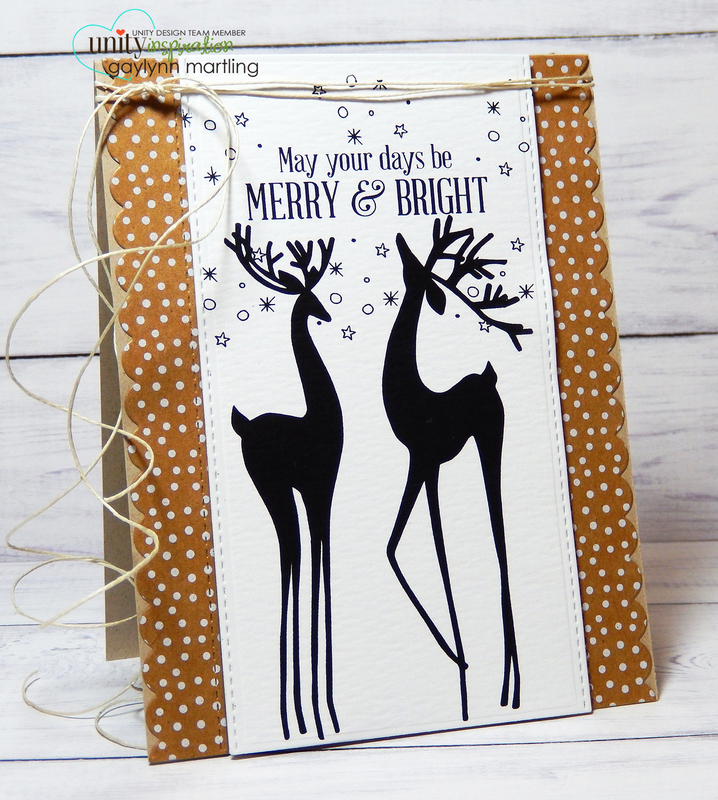 Here is a quick video tutorial for this deer card. And here is a closer view of the card. Supplies: Unity Stamp Co. 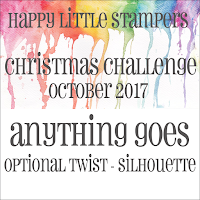 Cheerful Prancing 10/2017 Sentiment Kit by Lisa Arana, DCWV cardstock, My Favorite Things die-namics and hemp. I hope you enjoyed this early holiday project. Have a great weekend.